and dry them in the greenhouse. I place them throughout the garden for the birds to feed on. 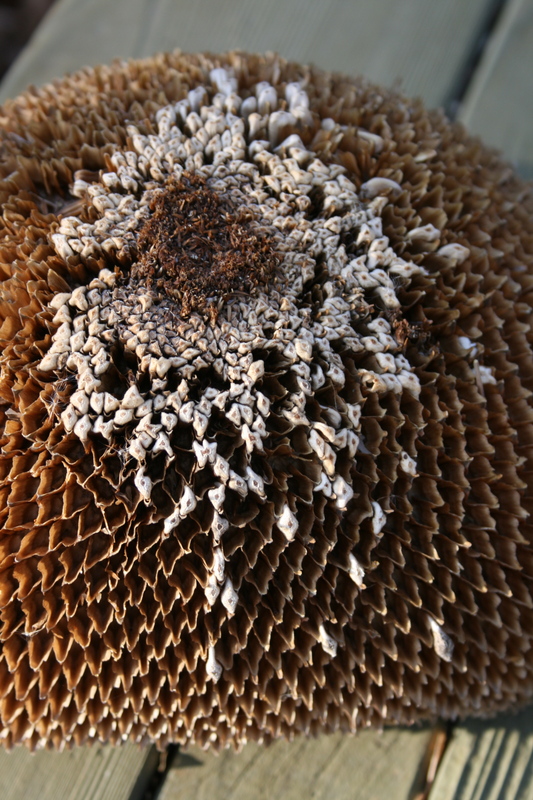 Inevitably some of the seeds drop to the ground and next Spring a fresh crop of Sunflowers grow in the garden. Now that’s a grand idea. Allow the birds to do some of your planting. And they did a great job–their plantings did beautifully! Even grew some Millet–all by themselves. That was my plan this year, but the sunflowers died because of the drought conditions here. I will try again next year. I also planted one entire row of Sunflower varieties along the North fence of the garden–these did horribly, same reason, just to dry. I couldn’t put down enough water for everything! The birdies will love the seeds. Sunflowers are one of my fav flowers. I don’t have enough sun to grow them any longer, but did get some beautiful ones from my crop share Farm. They were some deep burgundy ones I was totally into. As cut flowers they last in the house a long time. I love them dried just as much as when they are in full bloom!